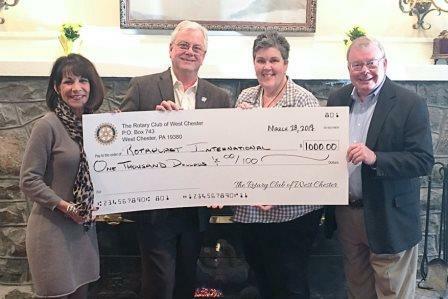 Cristina Combee (left) and Larry Miller (far right), members of the Rotary Club of West Chester International Services Committee, happily presented a check for $1,000 to Mark Cunningham Hill and Mary Ellen Mahan, members of the Rotary International Rotaplast Team at a recent Rotary meeting. Both Mary Ellen and Mark are newer Rotarians, having joined within the past five years, and were motivated by the opportunity that Rotary provides to give back to their communities. Mary Ellen, a member of the Twin Valley Club, was shocked at the number of kids with cleft palates, when visiting the Philippines. She shared her personal story of having a frenectomy which involved cutting the muscle form her jaw to her upper lip, and how self-conscious individuals feel about facial deformities. Mark, a member of the Paoli-Malvern-Berwyn Club, shared stories and photos of his mission trip to Monrovia, Liberia, highlighting the photos of the children before and after their surgeries. Both provided heartfelt, moving accounts of the work of Rotary's Rotaplast mission in the world, and how it changes lives. Our thanks to Steve Bayles for capturing this photo of these special people in our club, and on the International Team.